Stories of heroism during the fire emerged on a national day of mourning across Russia for the victims of the Kemerovo shopping mall fire. As Russia observed a national day of mourning and the first of the 64 victims of the inferno that engulfed a shopping mall in Siberia were laid to rest Wednesday, stories emerged of heroism in the face of the tragedy. Flags were lowered to half-staff across Russia as the first funerals took place in the industrial city of Kemerovo, about 1,900 miles east of Moscow. 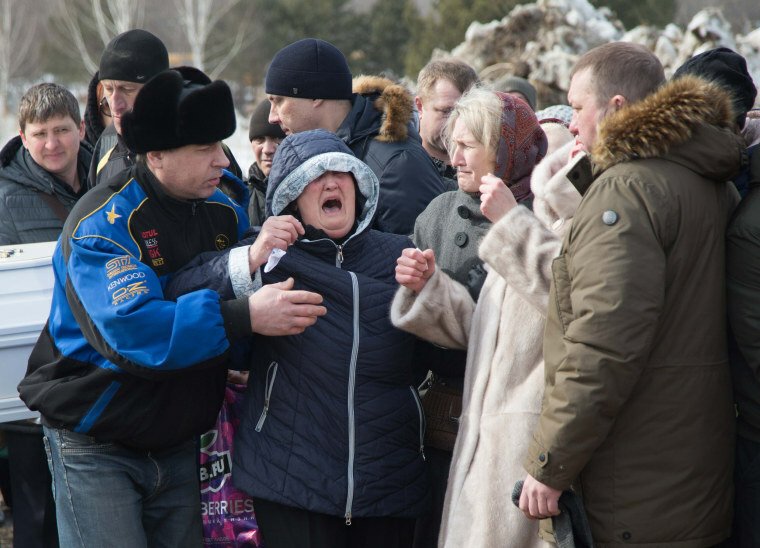 Mourners wailed as two elementary school-age siblings, Konstantin and Maria Agarkov, were buried alongside their grandmother Nadezhda, who perished with them in the fire, The Moscow Times reported. Meanwhile, the Russian Education Ministry reported that a high school teacher, Tatyana Darsaliya, rescued her own daughter and then ran back into the burning mall to save other people. "She was able to save several kids but did not make it out of the burning building herself," the ministry announced in a telegram, according to the TASS news agency. Russian officials also praised 17-year-old military cadet Dmitry Polukhin for leading three children to safety through the flames. But the prevailing moods in the Siberian city of half a million people have been anger and grief. Thousands of residents took to the streets of the main square Tuesday to express their outrage at local and national "corruption" for allowing mall operators to skirt safety regulations, which turned the Winter Cherry mall into a death trap once the fire broke out. Among the official death toll were 41 children, many of whom were trapped in a movie theater by locked exit doors. Five people have been arrested, including the mall's technical director and a security guard accused of turning off the fire alarm system. "Importantly, it should be clear for everyone that the investigation will make conclusions proceeding from the norms of law and regardless of the posts of any persons complicit in this tragedy," Russian President Vladimir Putin said Wednesday during a meeting with the committee investigating the fire, according to media reports. "The fire alarm system did not work for a week. Why? It had not been repaired for a week! Why wasn't it switched on, although the hand gear was workable? Why the doors turned out to be closed? Why combustible materials were used there? There are a lot of questions there."